Malmsbury, a small town located in 95 kilometers to the north-west from Melbourne, was founded some time in 19th century and still has some old buildings. This place can be easily found by following A79 road – Calder Hwy. 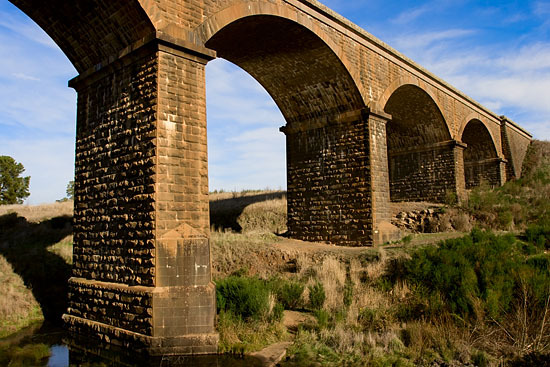 We found that the main attraction of this place is an old Viaduct – the oldest and longest (in its’ time) stone bridge in Australia. Bridge across Coliban River, was built in 1860-1862, has 25 meters in height, 152 meters long and consists of five 18-meter spans. 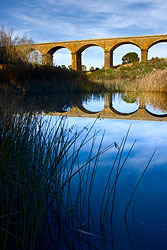 Bridge is still serving its’ original purpose – part of the railway from Melbourne to Bendigo. To see this 19th century architectural beauty, go to the small and cosy botanic garden next to the bridge and, if you’re lucky and there is water in the river, you may see a nice picture with viaduct reflected in small pond.